Diesels have been revolutionised in the last decade – just look at how many diesel passenger cars are now being sold around the world. So what’s transformed them from being smelly, noisy and dirty machines into their current refined form? In most cases, it’s their common rail direct injection systems. Let’s take a detailed technical look. Although the basic designs of petrol and diesel engines are similar (both are two or four stroke designs which use reciprocating pistons driving a crankshaft), a diesel engine does not compress its fuel/air charge and then initiate combustion by the use of a spark plug. Instead, in a diesel engine just air is compressed. When the piston is near Top Dead Centre, the fuel is sprayed by an injector into the combustion chamber, whereupon it mixes with the hot compressed air and self-ignites. In order that the air within the diesel combustion chamber reaches an adequate temperature for self-ignition to occur, the compression ratio needs to be much higher than found in a spark ignition engine. Compression ratios in the range of 16:1 to 24:1 are commonly used, giving forced aspirated diesel engines a compression pressure of up to 150 Bar. This generates temperatures of up to 900 degrees C. Since the ignition temperature of the most easily combustible components of diesel fuel is only 250 degrees C, it is easy to see why the fuel burns when it is injected after the piston has risen on the compression stroke. 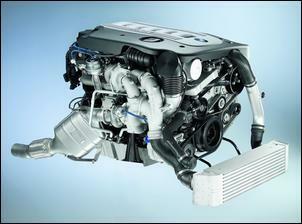 Diesel engines are designed to develop high torque at low engine speeds, resulting in better fuel economy. In recent years, the use of turbochargers and common rail direct injection have dramatically improved the specific torque output of diesel car engines. This diagram shows that specific torque has risen from about 70 Nm/litre to more than 182 Nm/litre over the last 20 years. 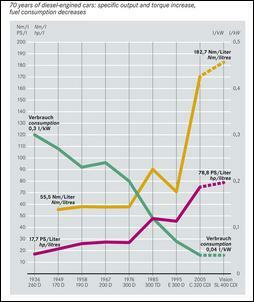 At the same time, specific fuel consumption has fallen by over 60 per cent! Compared with petrol-powered engines that most often run with stoichiometric mixtures (that is, the theoretically correct air/fuel ratio for complete combustion, which is about 14.7:1), diesels use very lean air/fuel ratios. The air/fuel ratios for diesel engines under full load are between 17:1 and 29:1, while when idling or under no load, this ratio can exceed 145:1. However, within the combustion chamber, localised air/fuel ratios vary – it is not possible to achieve a homogenous mixing of the fuel with the air within the combustion chamber. To reduce these in-chamber air/fuel ratio variations, large numbers of very small droplets of fuel are injected. Higher fuel pressure results in better fuel atomisation, so explaining the increase in injection pressures now being seen. Since the use of electronically controlled common rail injection allows these variables to be individually controlled, we’ll briefly look at each. The timing of the injection of fuel has a major affect on emission levels, fuel consumption and combustion noise. The optimal timing of the start of injection varies with engine load. In car engines, optimal injection at no load is within the window of 2 crankshaft degrees Before Top Dead Centre (BTDC) to 4 degrees After Top Dead Centre (ATDC). At part load this alters to 6 degrees BTDC to 4 degrees ATDC, while at full load the start of injection should occur from 6 – 15 degrees BTDC. The duration of combustion at full load is 40 – 60 degrees of crankshaft rotation. Too early an injection initiates combustion when the piston is still rising, reducing efficiency and so increasing fuel consumption. The sharp rise in cylinder pressure also increases noise. Too late an injection reduces torque and can result in incomplete combustion, increasing the emissions of unburned hydrocarbons. Unlike a conventional port fuel injected petrol engine, where the amount of fuel injected can be considered to be directly proportional to the injector opening time, a diesel injector will vary in mass flow depending on the difference between the injection and combustion chamber pressures, the density of the fuel (which is temperature dependent), and the dynamic compressibility of the fuel. The specified injector duration must therefore take these factors into account. Diesel fuel injectors do not add the fuel for a combustion cycle in one event, instead they operate in up to four different modes. The first is pre-injection, a short duration pulse which reduces combustion noise and Oxides of Nitrogen (NOx) emissions. The bulk of the fuel is then added in the main injection phase, before the injector is turned off momentarily before then adding a post-injection amount of fuel. This post-injection reduces soot emissions. Finally, at up to 180 crankshaft degrees later, a retarded post-injection can occur. The latter acts as a reducing agent for an NOx accumulator-type catalytic converter and/or raises the exhaust gas temperature for the regeneration of a particulate filter. The injection amounts vary between 1 cubic millimetre for pre-injection to 50 cubic millimetres for full-load delivery. The injection duration is 1-2 milliseconds. Unlike previous diesel fuel injection systems - even those electronically controlled – common rail systems use, as the name suggests, a common fuel pressure rail that feeds all injectors. (In this respect, common rail diesel systems are like traditional electronic fuel injected petrol engines.) By separating the functions of fuel pressure generation and fuel injection, a common rail system is able to supply fuel over a broader range of injection timing and pressure than previous systems. 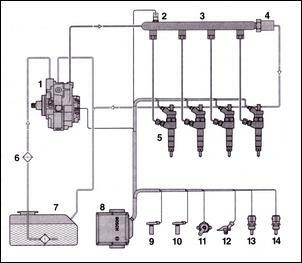 This diagram shows a simple common rail fuel injection system. A high pressure mechanical pump (1) pressurises the fuel which flows to the common rail (3). A fuel rail control valve (4) allows the fuel pressure to be maintained at a level set by the Electronic Control Unit (8). The common rail feeds the injectors (5). Sensor inputs to the ECU comprise fuel pressure (2), engine speed (9), camshaft position (10), accelerator pedal travel (11), boost pressure (12), intake air temperature (13) and engine coolant temperature (14). (6) and (7) are the fuel filter and fuel tank, respectively. Not shown on these diagrams are the glow plugs. Common rail diesels still use glow plugs, however their use is not normally required except for starting in ambient temperatures below 0 degrees C.
Extra ECU outputs can include control of turbocharger boost pressure, exhaust gas recirculation and intake port tumble flaps. Fuel pressures of up to 1600 Bar are generated by the high pressure pump. This pump, which is driven from the crankshaft, normally comprises a radial piston design of the type shown here. The pump is lubricated by the fuel and can absorb up to 3.8kW. So that pump flow can be varied with engine load, individual pistons of the pump are able to be shut down. This is achieved by using a solenoid to hold the intake valve of that piston open. However, when a piston is deactivated, the fuel delivery pressure fluctuates to a greater extent than when all three pistons are in operation. The fuel pressure control valve comprises a fuel-cooled solenoid valve. The valve opening is varied by its solenoid coil being pulse width modulated at a frequency of 1 KHz. 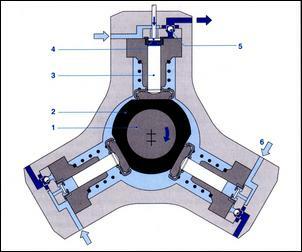 When the pressure control valve is not activated, its internal spring maintains a fuel pressure of about 100 Bar. When the valve is activated, the force of the electromagnet aids the spring, reducing the opening of the valve and so increasing fuel pressure. The fuel pressure control valve also acts as a mechanical pressure damper, smoothing the high frequency pressure pulses emanating from the radial piston pump when less than three pistons are activated. The fuel rail feeds each injector. It is made sufficiently large that the internal pressure is relatively unaffected by fuel being released from the injectors. As indicated earlier, the rail is fitted with a fuel pressure sensor. To guard against dangerously high fuel pressure, a fuel pressure relief valve is also fitted. The fuel injectors superficially look like the injectors used in conventional petrol injection systems but in fact differ significantly. 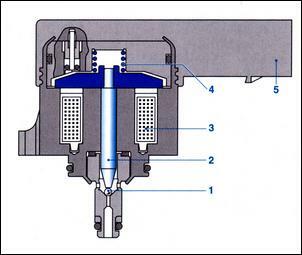 This diagram shows a common rail injector. 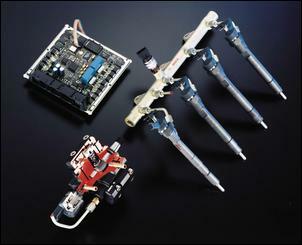 Because of the very high fuel rail pressure, the injectors use a hydraulic servo system to operate. In this design, the solenoid armature controls not the pintle but instead the movement of a small ball which regulates the flow of fuel from a valve control chamber within the injector. The life of a common rail diesel fuel injector is certainly a hard one. Bosch estimates a commercial vehicle injector will open and close more than a billion times in its service life. Five major approaches are taken to reducing diesel exhaust emissions. Within the engine itself, the design of the combustion chamber, the placement of the injection nozzle and the use of small droplets all help reduce the production of emissions at their source. Accurate control of engine speed, injection mass, injection timing, pressures, temperatures and the air/fuel ratio are used to decrease emissions of oxides of nitrogen, particulates, hydrocarbons and carbon monoxide. Exhaust gas recirculation, where a proportion of the exhaust gas is mixed with the intake charge, is also used to reduce oxides of nitrogen emissions. It does this by reducing the oxygen concentration in the combustion chamber, the amount of exhaust gas passing into the atmosphere, and the exhaust gas temperature. Recirculation rates can as high as 50 per cent. Diesel oxidation-type catalytic converters can be used to reduce hydrocarbon and carbon monoxide emissions, converting these to water and carbon dioxide. 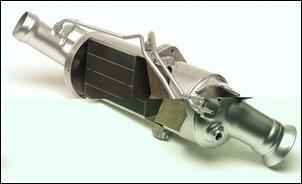 So they rapidly reach their operating temperature, this type of catalytic converter is fitted close to the engine. Detecting when regeneration needs to occur, and then when it has been fully completed, is complex. The need for regeneration can be assessed by the use of a model that calculates the quantity of stored nitrogen oxides on the basis of catalytic converter temperature. Alternatively, a specific NOx sensor can be located downstream of the accumulator catalytic converter to detect when the efficiency of the device is decreasing. Assessing when regeneration is complete is done by either a model-based approach or an oxygen sensor located downstream of the cat; a change in signal from high oxygen to low oxygen indicates the end of the regeneration phase. In order that the NOx storage cat works effectively from cold, an electric exhaust gas heater can be employed. One of the most interesting approaches to diesel exhaust treatment is Selective Catalytic Reduction. In this approach, a reducing agent such as dilute urea solution is added to the exhaust in minutely measured quantities. 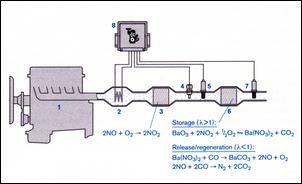 A hydrolysing catalytic converter then converts the urea to ammonia, which reacts with NOx to form nitrogen and water. This system is so effective at reducing NOx emissions that leaner than normal air/fuel ratios can be used, resulting in improved fuel economy. The urea tank is filled at each service. Exhaust particulate filters are made from porous ceramic materials. When they become full, they can be regenerated by being heated to above 600 degrees C. This is a higher exhaust gas temperature than is normally experienced in diesels and to achieve this, retarded injection and intake flow restriction can be used to increase the temperature of the exhaust gas. As can be seen, dramatic changes in both the fuel injection system and exhaust aftertreatment have occurred in diesel technology. Next week, we’ll look at how the electronic control system makes it all function.